As part of SSSJ’s Japanese education, a moving library opens every Saturday on school days. Currently, this library contains approximately 2000 books. Students can borrow up to 5 items per day. The rental period is 2 weeks. Please write your full name and class on the rental card of the item (book or DVD) you would like to borrow. Afterwards, bring the item and the rental card to reception who will press a return date stamp. We would like to ask parents to complete the rental card for younger students who are unable to write down their own names. To avoid damaging the books, please bring a library bag when borrowing books. There are no restrictions to size or material. A certificate of commendation will be awarded to the top readers who receive the most certificates. Please read the rules on the back of the stamp sheet. Please return it to the return box by the scheduled return date. Further proceudres are not required. Plesae return books and videos before the first period of classes. Please place books gently and not throw them into the return box. Please be careful not to return Japanese books of other libraries by mistake. Please be careful not to return books from SSSJ to other libraries by mistake. 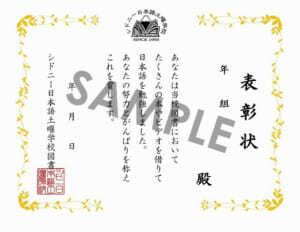 Students who receive 50 stamps will receive the following certificate.